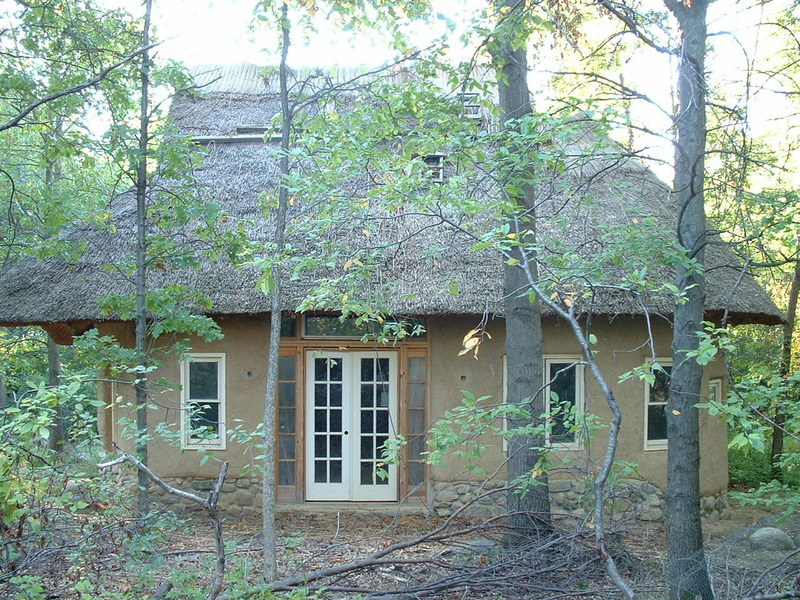 The Strawbale Studio, an enchanting thatched roof studio in rural Oxford Michigan, was conceived in 1996 by Fran Lee (original owner), Deanne Bednar, and Carolyn Koch . 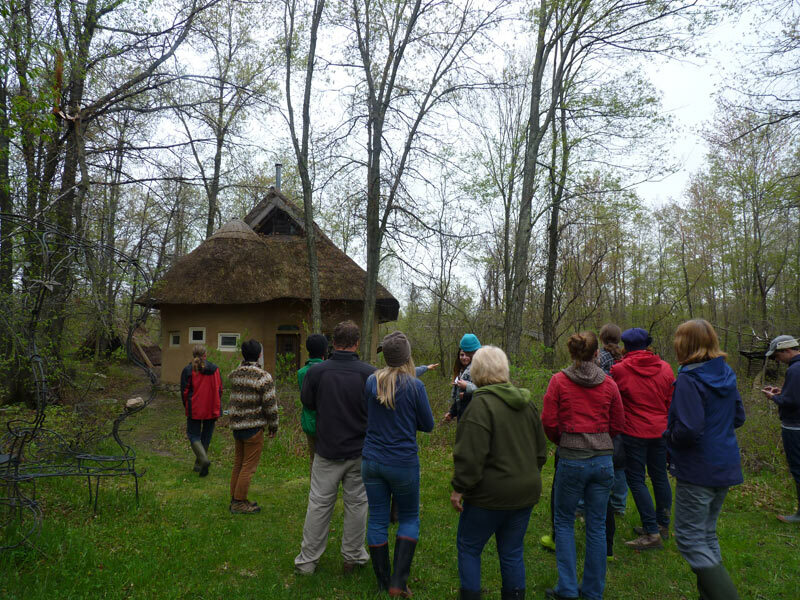 None of these women are professionals, yet they were able with help, guidance, and intuition to build this beautiful natural structure, which today offers tours, workshops, and hands-on experience with natural building materials. It has been the “work of many hands” and volunteers of all ages. Books which inspired the project include Christopher Day’s Places of the Soul: Architecture and Environmental Design as a Healing Art, as well as The Timeless Way of Building and A Pattern Language by Christopher Alexander. 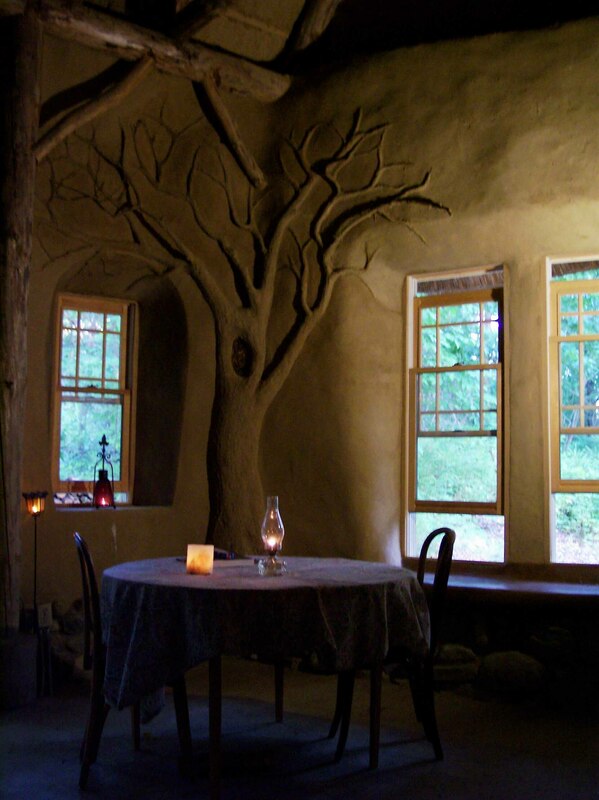 Deanne, the current owner, writes: The Strawbale Studio is a 650 square foot structure that features strawbale (earth plastered) walls, a round log frame, earthen floor, field stone foundation, a loft, and sculptural artwork. We hope you enjoy reading about the history of the project and learning about upcoming events and opportunities. As you begin to immerse yourself in the art of natural building, we hope you can come plerk (work + play = plerk) with us on this evolving adventure! Due to the fluidity and flexibility of natural building materials, we were able to mold the studio around existing trees. You’ll notice that even the shape of the studio is ‘natural,’ not manufactured nor rectangular, but irregular, and dynamic. It’s very easy to mold natural plasters into any shape you desire, making it an art form as well as a building material! This makes for a very comfortable living space, and in fact, many people, upon entering such a natural structure, comment first not on how it looks, but on how it feels. 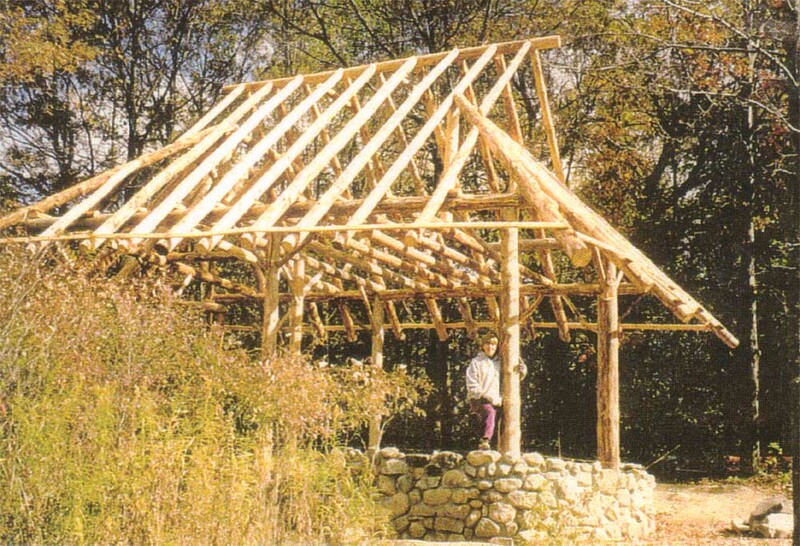 There are two types of strawbale structures: load-bearing and post-and-beam. 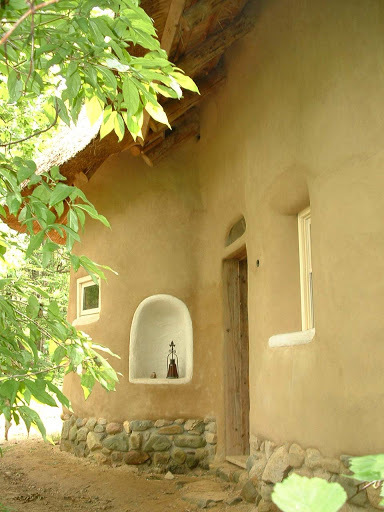 The studio is an example of a post-and-beam strawbale structure, where a foundation is built of wood or other material, and straw serves to insulate the walls. In a load-bearing structure — the original Nebraskan strawbales were load bearing — the straw actually holds the weight of the roof. Straw is stronger than you might think! In northern climates (such as Michigan), where snow cover may weigh down the roof considerably, load-bearing is a more practical option. 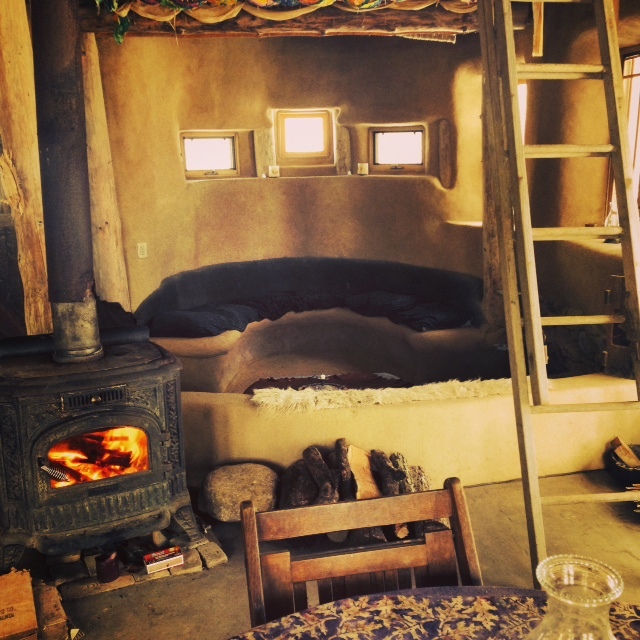 Here you see the wooden frame and stone foundation of the Strawbale Studio. An early concept drawing of the Strawbale Studio.